Investigating the mysterious death of a young woman who wandered into one an underground tunnel and never came out—but lives on as an internet rumor. The closest thing in real life to the deadly labyrinth of King Minos—or, if you prefer, the one from the movie Labyrinth—is a network of tunnels under the city of Odessa, Ukraine. They're the backdrop for the tragic tale of Masha, an innocent partygoer who ventured down into the depths with some friends, took a wrong turn or two, and got lost forever. But despite being passed around the internet as fact, there is little documentation to support the legend of Masha. Like most information about these catacombs, only Ukrainian cave explorers even claim to know the details. According to the 2009 forum post on Urban Explorer's Resource (UER) by a catacombs explorer named Eugene Lata, who brought Masha's story to the English-speaking world, the tale begins late on New Year's Day (or possibly New Year's Eve) in 2005. It was a foggy night with temperatures hovering around freezing. Masha went out with a large group of friends to celebrate and probably get drunk. It's not known if they were former students of Odessa's School Number 56, but according to references to the story in Russian news, that's where they found the entrance to the mines. Clearly, this was a bad idea. The only Ukrainians who have any official business down there are workers in active mines who still dig for limestone. However, that hasn't stopped many people from making the same trip Masha apparently made. There are stories of industrious winemakers and mushroom growers who go down there regularly to leave their product to age or grow, confident no one will find it and interfere. We don't know for sure what Masha was looking for when she went into the catacombs with her friends. They could have been looking for treasures that night, considering there are rumors that somewhere below School 56 there's a solid gold replica of the Titanic a few inches long. Or maybe they were looking for bodies. There is a rumor that the catacombs contain the stacked corpses of murdered Jews from World War II. There's also evidence that they were used for the summary executions of Nazi soldiers. The catacombs are not easy to navigate, especially when you're drunk like Masha might have been that night. By some estimates, they span 1,550 miles, making the network a little longer than the whole Pacific coastline of the continuous United States. The next-largest network of catacombs is in Paris, and that's only one-fifth the length of Odessa's. They're not the safest places to be either. Some sections regularly flood with groundwater, others have ceilings precariously propped up with ad-hoc support beams, or they've had their ventilation systems completely dismantled. They're also a pretty good place to stage a murder. Last month, a guy in his 20s was sentenced for reportedly murdering his teenage girlfriend in the catacombs with an ax. In 2011, a male murder victim was found by chance in the catacombs after he had been dead for three to six months. But being murdered and having your body dumped in the catacombs is a vacation compared to what is rumored to have happened to Masha. The teens are said to have stayed down there all night. In the morning, they braved the morning cold to get back to hearth and home. But in their foggy states, they absentmindedly—or maliciously—left Masha in the catacombs. If she'd wandered into isolation, maybe to find a secluded spot to relieve herself, it's easy to imagine she was beyond screaming distance. Maybe her path forked a few times, and she lost track of the pattern. It's not unlikely that she drunkenly forgot to leave a trail of breadcrumbs. If the area near School 56 had no groundwater—or clandestine wine or mushrooms—there would have been nothing for her to eat or drink. There also would have been nowhere to stay warm, since that area is also not deep enough for it to have been much warmer than the chilly surface weather that night. It would have been utterly black. But even with a light and a map of the catacombs, it would have been hard for someone ill-prepared to make it out, because the maps that exist are a maddening, brain-like scrawl. Assuming Masha brought a battery-powered flashlight or lantern down into the depths, it would have died after a few hours, making it harder to continue the search for warmth and water. If she was lucky, she died quickly from the cold. If it was too warm to freeze, and she was exerting herself trying to survive, dehydration would have become severe in perhaps only two days before the symptoms became debilitating. She would have gotten delirious, convulsed, and slipped irreversibly into a coma around the third day, not that she would have noticed the days passing. She couldn't have lasted more than a week. "During the time she was inside, her 'friends' didn't try to take her body out," Lata wrote, guessing that they were "frightened." About four months after New Years in April of 2005, word spread among cave explorers that there was a fresh body down there, Lata wrote in a his UER post in 2009. The most famous photo—one that Lata told VICE in an email that he was involved in taking—shows three blank-faced boys who look like they're in their early teens, posing like they've just stumbled upon the body in a narrow, curved section of the cavern. In the photo, Masha is unidentifiable beyond simply being a human. She lies on her left side, legs curled like she's sleeping, while the upper half of her decomposing body has lost its form altogether, and has begun to turn indistinguishable from the cavern's yellow limestone floor. Two years passed, and no one retrieved the body, Lata claims. He recalls that a piece of writing by a friend he says is a "famous journalist" was delivered to government officials. It's not clear what the journalist wrote, but Lata claims the government got moving and removed the body less than 24 hours later. Kostya Pugovkin, who identified himself as a veteran of Ukraine's Antiterrorist Operation based in Odessa, claims to be the one who personally hefted the body in that photograph out of the depths. His recollection is different from Lata's. According to Pugovkin, someone else had vanished in 2004: Janis Stendzenieks, the son of a newspaper magnate named Armand Stendzenieks. Pugovkin told us the elder Stendzenieks was offering a reward to anyone who could find his son, and some people he called "diggers"—manual laborers—had tipped off the authorities about a body two to three miles from an entrance to the catacombs. With his heart set on a possible reward, Pugovkin says he crawled into the depths and eventually stumbled upon what he called "bone soup." The rest of the process wasn't exactly CSI: Odessa. "I wrapped it in a bedsheet, and dragged it back," he told VICE through a translator. "It was hard to get to the top of the shaft—it was like nine floors, tiers with skinny ladders between them." He told us he then dragged the body to the police medical examiner's office, about five miles from the entrance Masha would have used. But he claims that when Armand Stendzenieks ordered a DNA test, it wasn't a match. The mystery person was of no value at all, Pugovkin says. "The diggers determined it was a Satanist who got lost." "They say it was a girl," he adds. But according to the official Odessa Catacombs website, the whole story of Masha is a lie. "Besides the original photographer," a post says, "there isn't one person, civilian or law enforcement, that can confirm the story. We believe it is just a practical joke and the corpse is fake." It would be a strange, unfunnny practical joke. Lata says he was there when that photo was taken, but he can't retrace the photo to its origin. "There were four of us on the day when these pics were taken," he wrote, "and I really don't know where I can find these guys nowadays." Oddly, Lata told us the person responsible for the official Catacombs website—and the one calling him a liar—is "one of the most experienced Odessa catacombs explorers and my best friend." Since the organization is in charge of fielding inquiries about the Catacombs it "probably prefers to stay out of this business, just as I do," Lata theorized. So it's a photo of a body that will—it seems—never be positively identified, and it immortalizes the last moment of someone's life. Whether that person is an innocent partygoer, a Satanist, or a Ukrainian drunk who took a few steps too many into the darkness, it sends imaginations soaring because it conjures the exact kind of nightmarish, lonely death everyone fears the most. The photo proves that Hell is a real place, and it's about nine stories beneath Odessa. Even after the "Masha," episode, Lata continued to explore the catacombs. His descriptions of his journeys into the dark were tantalizing tales of adventure. In a post from 2010, he claimed that he used to take trips that lasted over a week, and that he'd fill his "catacombs bag" with food, camping equipment, diving gear, and mapmaking tools to prepare for long trips. By 2012, he had begun to sound less like the internet's ambassador to the catacombs. In his last post, he wrote that the place was pretty much charted, and claimed that there's not much left to explore. Then he added that a young boy had just been lost in an accident, and his body was still missing. Also, he wrote, "five explorers [got] lost or died during this year." "That's why I really beg you not to try to walk underground in Odessa itself. 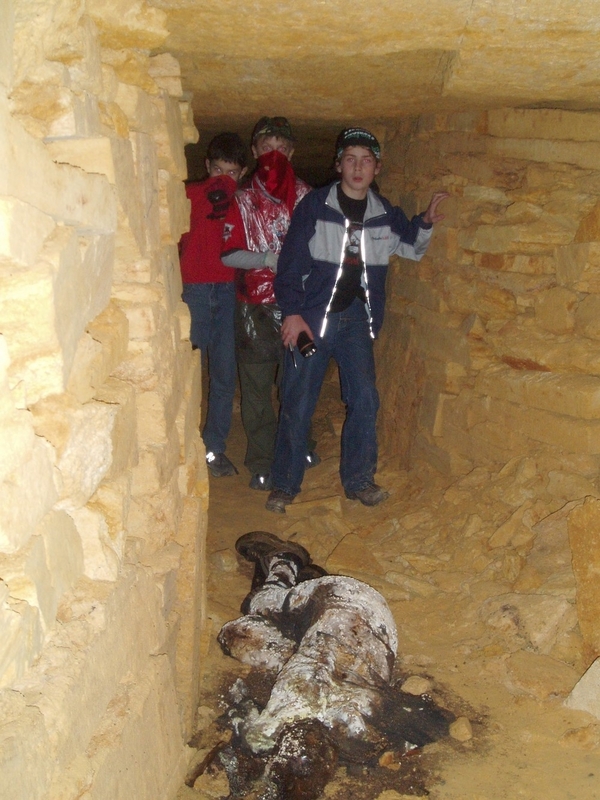 It can be really dangerous," he wrote, adding "here are some new pictures of our catacombs. Enjoy." Jules Suzdaltsev contributed reporting to this piece.